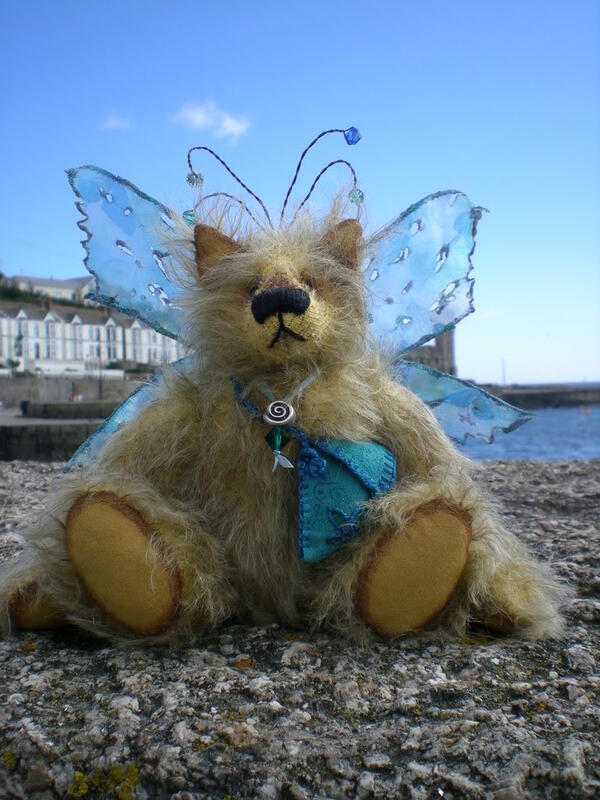 Here is my latest beary,Inspired by one of my favorite beaches, Porthleven. Porthelven is a little faerie Elf bear, with wings, swarovski antennea, and with a pouch full of secrets. This is the first time I have put so much detail on a bear, and I had great fun photographing him ysterday on the beach in the sun, Shame his sparkles havent shown up as much on the photos as the sun was making him sparkle so much. Job/hobbies : I run a little craft gallery and wool shop in St Ives. OK so i worked our how to add photos, brill instructions Paula, but wasnt expecting them to be soo BIG!! Well done on working out the photo thing Kay! It took me a while too! If you want slightly smaller photos, the best thing to do is to size them smaller in your photo editing software before uploading them to your host (ie., photobucket or the forum host etc) As a rough idea, I tend to size mine at 450 pixels wide and 72dpi ... that gives a reasonable size photo, not too big, not too small. Having said that, I think your pics are absolutely lovely! 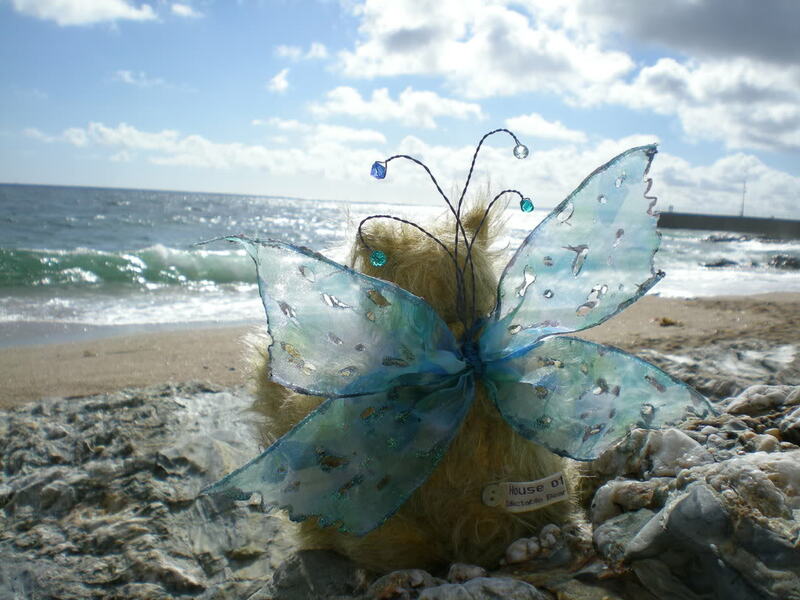 I love the one taken from the back of your bear especially, with his wings catching in the sunlight and that wonderful sea ... beautiful! Gorgeous detailing! Cheers Paula, thats my favorite too, he sold on sunday so is flying of to pastues new. The photos dont really show just how sparkley he is, My favorite bear to date i think. Kay, I have to ask, how's the weather in Cornwall this week? Two of my sisters are camping down there with their kids and husbands (Praa Sands I think) and I just keep seeing awful weather forecasts on the telly! It's been glorious here in Kent, so I'm hoping that the beautiful Cornish sun has crept out without telling the Met Office! hate to tell you Paula, but today its pouring all over penwith north coast, south coast may be different but I doubt it, Poor Fiona! So differnet from the weekend, even i managed to get burnt! Oh dear! Tina and Lynda will be soggy (and probably quite grumpy!) under canvas! Fiona however, is currently sunning herself in Egypt! The pictures you have taken are AMAZING!!! Like a picture postcard! And the bear is very, very cute! Humor : Rude and crude! Cheers Gemma, It' squite easy to get a postcard look when you livein such a beautifull place when the sun is shinning! He has now gone of to pastures new.